Join Dr. Yassa and other researchers at the next Ask the Doc forum! 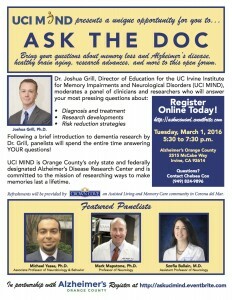 What: UCI MIND’s Panel of Researchers Meet to Answer Your Questions! Join us at Lakeview Senior Center in Irvine! Congratulations to Matt Tsai who was awarded the Brian Atwood Scholarship! Congratulations to Stephanie Leal on successfully defending her dissertation and earning her Ph.D.
Join Dr. Yassa at Oasis Senior Center May 10, 2016! New paper on recognition memory and the hippocampal long-axis gets the cover of the Journal of Neuroscience!